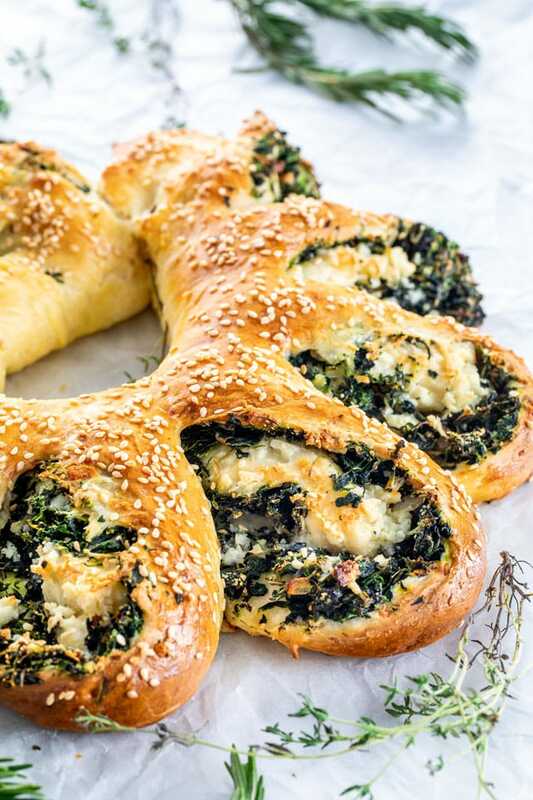 This Spinach Feta Wreath has the flavors of spanakopita, but made with a cheesy, delicious made from scratch dough! Perfect for a special brunch or dinner! Let the baking season begin! At least for me. I’m ready, I’m so ready! 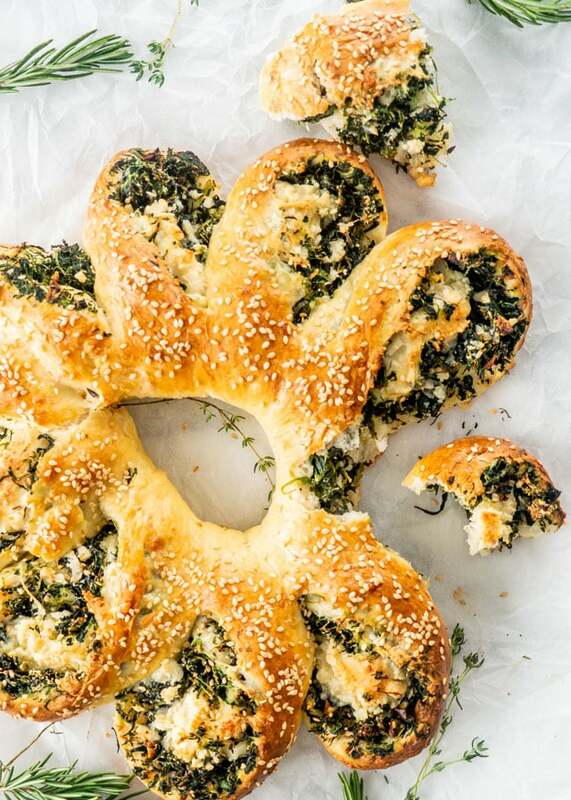 Keep in mind I’m not a fancy baker, but I do love to bake savory baked goods, like this spinach feta wreath. This kind of baking is right up my alley. 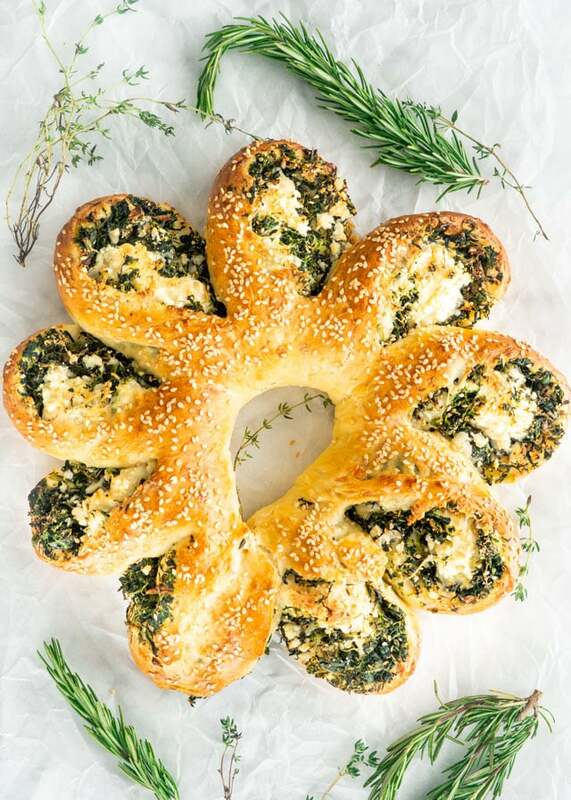 The flavors in this wreath are really quite similar to a spanakopita, a popular Greek appetizer of phyllo pastry stuffed with feta and cheese. In this recipe, while the filling is similar, the dough is completely different. 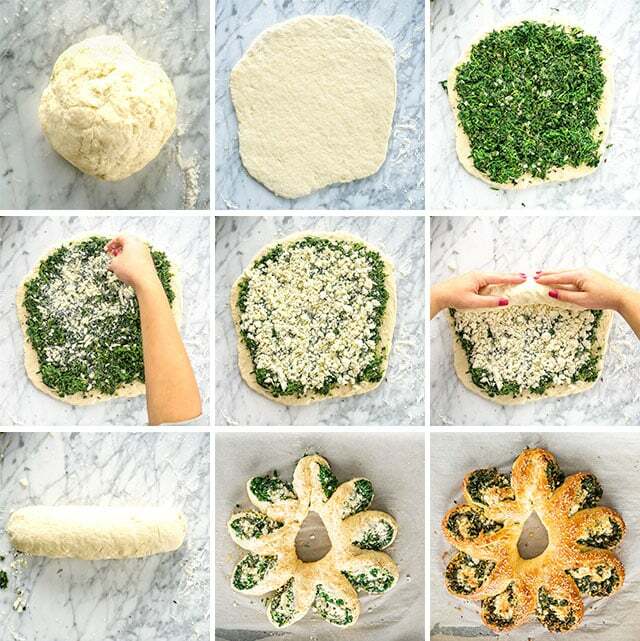 It’s a cheesy, buttery, delicious dough, that’s super easy to put together. 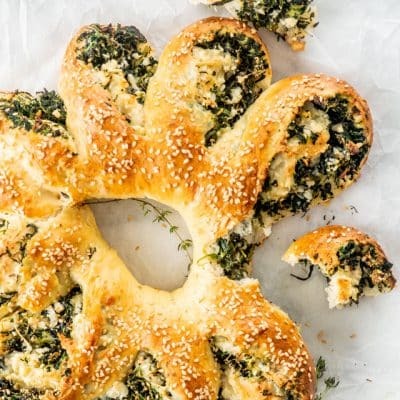 To make this delicious, savory wreath, you first have to make the filling which is simply made with onion, spinach and herbs such as rosemary and thyme. If you’re not a fan of herbs, you can simply omit these and it will still be delicious. The dough is quite simple to make, it’s yeast free, with butter and buttermilk and my secret ingredient, some Parmesan cheese, because parmesan cheese. No explanation required. Then all that’s left to do is to simply roll out the dough and fill with the spinach filling, more Parmesan cheese and lots of feta cheese. You can roll this out and cut it in slices and bake it like you would bake cinnamon rolls, or form it into a wreath like I did. It’s perfect if you want to impress your guests. Heat the olive oil in a large skillet. Add the onion and cook until it softens, about 3 minutes. Add the spinach and cook, stirring occasionally, for an additional 2 minutes. If your spinach is watery, this is the time to squeeze out additional water, however, if you do it before adding it to the skillet, there shouldn't be any excess water. Turn off the heat and add the rosemary, thyme and stir. Set aside and let cool. Preheat the oven to 400 F degrees and line a baking sheet with parchment paper. In a large bowl combine together the flour, baking powder and salt. Add the butter and using a pastry blender or 2 forks, mix it in with the flour. Stir in the Parmesan cheese. Make a well in the center and add the buttermilk and egg. 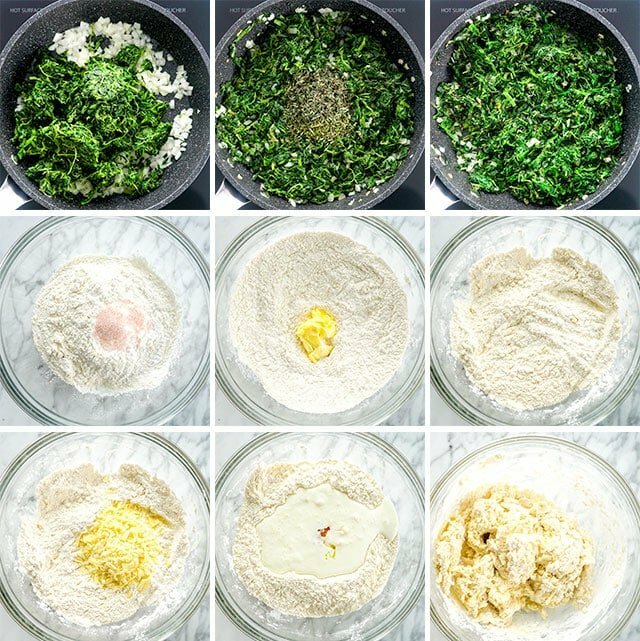 Mix it until combined. It should be a soft sticky dough. Flour your work surface well, place the dough on your work surface and knead it gently until smooth, adding more flour as necessary. I added another 1/4 cup of flour, until the dough no longer stuck to my hands. Keep in mind it's a soft dough. Roll out the dough into a square until it's about 1/2 inch in thickness. Spread the spinach mixture over the dough, leaving about 1/2 inch strip along the edges. Sprinkle with Parmesan cheese and feta cheese over the spinach. Roll up firmly, and pinch the edges together. Place the roll on the prepared baking sheet, seam side down. Using scissors or a sharp knife cut 1 inch slices, leaving about 1 1/2 inches from the end. Bring the two ends together to form a circle. You could place a small bowl or ramekin in the center to make this easier. Take each slice and turn it over on its side, and repeat with each one, slightly overlapping it with the previous one. Brush the wreath with the beaten egg and sprinkle with sesame seeds. Place the baking sheet in the oven and bake for 30 to 40 minutes or until golden. The loaf should sound hollow when tapped. Let it stand for 30 minutes before serving. Alternatively, you could cut the roll into 1 inch slice and place them into a greased 9x13 inch baking pan and bake as instructed. This wreath is best served on the day it's made, however if you're having it the next day, it's best when warmed up, place it on a baking sheet and heat it up in the oven. Hey Jo, I LOVE your recipes! I always get good results and rave reviews when I try them! Can you please tell me if this recipe uses salted or unsalted butter. I notice you often use unsalted, is there a particular reason for this? Thanks for sharing your gift with us! this is such a fun recipe for entertaining with a small group of friends, thank you for this recipe, love all of these flavors and so creatively made into a wreath! I’ll never try this in a million years, but I wanted to tell you that I think it’s fabulous! Looks delicious! Can this be made gluten free? If you use gluten free flour and some xanthan gum, yes.